A U.S. secret agent is sent to the distant space city of Alphaville where he must find a missing person and free the city from its tyrannical ruler. Pierrot escapes his boring society and travels from Paris to the Mediterranean Sea with Marianne, a girl chased by hit-men from Algeria. They lead an unorthodox life, always on the run. Screenwriter Paul Javal's marriage to his wife Camille disintegrates during movie production as she spends time with the producer. Layered conflicts between art and business ensue. Two crooks with a fondness for old Hollywood B-movies convince a languages student to help them commit a robbery. A surreal tale of a married couple going on a road trip to visit the wife's parents with the intention of killing them for the inheritance. During the Algerian War, a man and woman from opposing sides fall in love with one another. A superifical woman finds conflict choosing between her abusive husband and her vain lover. Natacha Von Braun: In life, one can only know the present. No one's lived in the past, or will live in the future. First and foremost a spoof. Lemmy Caution, a French version of Sam Spade -- or perhaps a James Bond gone to seed -- is on a mission: "liquidate" the tyrannical Dr. Vonbraun, inventor of the "death ray" and the Orwellian supercomputer, Alpha 60. But to get Vonbraun, Lemmy must make the intergalactic voyage from his home in the Outlands (roughly, "Nueva York") to Alphaville (roughly, mid-Sixties Paris). He gets there via his Ford Galaxy. That's right -- a car. Are you with me so far? 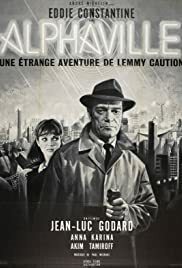 The key to understanding Jean-Luc Godard's *Alphaville* is to realize that it is first and foremost a spoof. It spoofs nearly everything it touches: science fiction; comic-books; George Orwell; Aldous Huxley; American private-eye movies; spy movies; technology in general and computers in particular; romantic love as presented in cinema. If you sit down to watch this expecting a high-minded piece of French New Wave cinema, you're going to end up being put-off. Those familiar with Godard will perhaps be less put-off. After all, when was this guy ever really "high-minded", anyway? Godard was the prankster of the "Cahiers du Cinema" gang. Just listen to the score by Paul Misraki if you're looking for the tongue in the cheek. 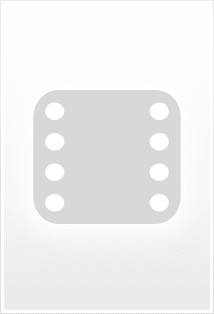 Even the putative theme of the movie, which is the priority of "love" and artistic creativity over logic and technology personified by the talking Alpha 60 supercomputer, is not taken too seriously. "Love" is personified by the beautiful dingbat princess, Natasha Vonbraun (Anna Karina), who doesn't even know what the word means. She's a child, as easily manipulated by Lemmy Caution as she is by the technocrats of Alphaville. Therefore, our rooting interest for humanity resides in Lemmy. Eddie Constantine reprises the role of Caution, a popular TV character in France during the Fifties, for Godard here: Lord knows what Constantine thought when he first read the script. The way he delivers the line, "This 'Alphaville' ought to be called 'Zeroville!'" gives a forceful indication of his bemusement. He submits to Godard's nouvelle vagueisms like a good soldier, delivering a fantastic performance in the process. Raoul Coutard's cinematography captures the heartlessness of the architecture in mid-Sixties Paris, which seemed to consist of blocky buildings blaring florescent lighting from every window, claustrophobic corridors, run-down apartments, and endless spiral staircases. 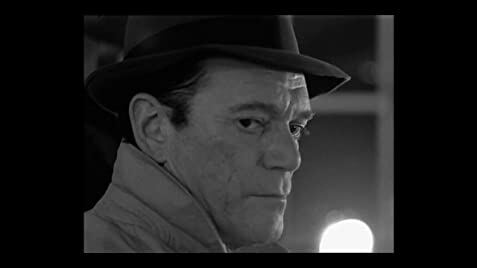 It's a pitiless place, which perhaps was Godard's one serious statement amidst all the postmodern, meta-cinematic foolery: we're living in Alphaville already. Altogether, this is Godard's most satisfying film. Despite all its detractors, *Alphaville* still survives (in a Criterion edition, no less). Classics always do. 105 of 121 people found this review helpful. Was this review helpful to you?